Graham Hair is principally a composer, but also involved in performance and research. He divides his time between the UK, Australia and the United States. In the UK he is Professor Emeritus (formerly Gardiner Chair in Music) of Glasgow University's Music Department and Research Fellow of its Science and Music Research Group (School of Engineering), Visiting Professor of Manchester Metropolitan University's Department of Contemporary Arts, and Director of the Glasgow-based vocal ensemble Scottish Voices. In the United States he conducts composer-residencies and concerts: most recently (in 2009) directing Scottish Voices on tour in Maryland, Delaware and Virginia, and (in 2011) recording tracks for the CD Music of Three Continents to be issued in the US by Parma Recordings in 2012.
a composer-residency at the Montsalvat Arts Centre in Melbourne. Frenzy and Folly, Fire and Joy for clarinettists Roslyn Dunlop, Craig Hill and Peter Handsworth. During 2003-2007 he was Australia Council Composition Fellow, which funded him to write several works for Australian soloists, ensembles and choirs. O Venezia (2004-2005, SSAA/harp), one of several works on Venetian themes, for the women's voices of the Halcyon Ensemble (Sydney, Canberra and Melbourne), Pandora's Vox (Boston) and the composer's own ensemble, Scottish Voices (Glasgow). His research interests include regional, transplanted and post-colonial musics. This includes various aspects of Australian, New Zealand, Scottish and American music, and the music of 'Hitler's émigrés'. A second interest is in 'Empirical Performance Studies' in which the methods of science and technology are used to discover information about musical performance which is difficult to access using the methodologies of the humanities and the 'coded knowledge' embodied in performing traditions alone. His recent research often involves multi-disciplinary, interdisciplinary or cross-disciplinary collaboration. One such collaboration was Rehearsing Microtonal Music: Grappling with Performance and Intonational Problems with Dr Nick Bailey and Douglas McGilvray (Glasgow University, Electronics), clarinettist Ingrid Pearson (Royal College of Music, London), soprano Amanda Morrison (BBC Singers, Steve Reich and Musicians, Scottish Voices et al) and Dr Richard Parncutt (Institüt für Musikwissenschaft, Graz, Austria), in which performers' capacities to play music using the microtonal scale with 19 steps in the octave was investigated. Notis Musycall: Essays on Music and Scottish Culture in Honour of Kenneth Elliott. Collections of essays on Australian composer Don Banks and on Matyas Seiber (Hitler émigré, 1905-1960, long resident in London, and teacher of many composers, including Don Banks) are available on this site. Two monographs (Meeting Place: The Music of Don Banks and The Music of Matyas Seiber), which extend and develop both these collections of essays, are in preparation. The Carnegie-Trust-funded collaborative project A Companion to Recent Scottish Music is also well advanced. Some items from this symposium are available on this site (see above). The first volume of the Companion will appear in print in 2010. Graham has co-convened the 5 annual Musica Scotica conferences (2005�2009) in Glasgow and Edinburgh on 800 years of Scottish Music. The volume Musica Scotica: 800 years of Scottish Music/Proceedings from the 2004 and 2005 Conferences, which he co-edited with Heather Kelsall and Dr Kenneth Elliott, appeared in 2008. Outputs from Research and Composition Projects appear here as soon as copyright and other issues permit. Sometimes definitive outputs take some time to finalise after the conclusion of the actual research project, and sometimes outputs from projects undergo further development (or, in some cases, revision), or new projects grow out of earlier ones. Support given by the various funding bodies is also acknowledged, where appropriate. Each member of the trio had a solo piece. "Naming the Stars", Higuma�s solo, was fantastic; ethereal and elegant, it floated along and filled the church with its delicate melody. A selection of the Transcendental Concert Studies, played by Michael Kieran Harvey, has been released on CD in 2008. A complete recording, by Martin Jones, will be released in 2011. What is Referential (�Motivic�) Tonality, and How Does It Differ from Functional Tonality? �Performance-Oriented� and �Work-Oriented� Compositional Processes: What is the Difference, and How is It Exemplified in Selected Recent Compositional Applications? Pick of the program was the Hair work, a setting of poems by Malouf, McAuley and the famous Judith Wright lyric that gave the work its title. Here the four voices were put to brilliant use, notably in the colouful word-painting of Malouf's Harmonice Mundi, and then a series of evocative solos for soprano Alison Morgan in To the Holy Spirit by Tasmania's noted Catholic poet. But for an ideal illustration of Hair's insight into setting texts, the Wright poem proved the most engaging and gripping. The voices moved together and apart with masterly variety, the text given its due and remaining clear even in verbally complex passages, the accompanying string quartet shimmering with excitement and providing a vivid commentary on the verbal content, separate but equal with the Halcyon voices and having the last say in a postlude of unabashed euphony and humanity: a most moving work, that we could easily have heard again. Graham Hair's plainly-titled Octet with Voices, in which four female singers from Scottish Voices joined with the Edinburgh Quartet in a performance conducted by the composer, was, in fact, far from plain. An exuberant triptych of settings of texts by David Malouf, James McAuley and Judith Wright, the beautifully-crafted Octet, which had all the colour and sensitivity of Ravel, lifted the concert onto a different level, with gleaming singing from the Scottish Voices, and the quartet's best playing of the night. A "multi-cultural" cycle of motets to texts from all three "Abrahamic" traditions. Ecstasy and Enlightenment: a sequence (for soprano, clarinet and string quartet) based on the Mystical Islamic poetry of Jelaluddin Rumi, in the elegant Edwardian (1903) translations of Glasgow theologian William Hastie (based in turn on the German versions of Friedrich Ruckert). Five paraphrases of American popular songs for SAA and piano. Play All Play American Waltzes (complete). Paraphrases of American popular songs for SAA and piano. The Principal Investigator for this project (2006�2007) was Dr Ingrid Pearson, Deputy Director of the Graduate School, Royal College of Music. For this project, three microtonal songs (based on the tempered scale with 19 tones per octave) were composed, and workshopped with the musicians (Ingrid herself on clarinet, with soprano Amanda Morrison), in order to develop (via technological assistance from engineers Dr Nick Bailey and Dr Dougie McGilvray and advice on psychological aspects from Dr Richard Parncutt) some guidelines about the extent and limits of the musicians' perceptual and performing capacities with regard to microtonal materials. Play PDF Score Download/Play (Playing requires Java) Three Microtonal Songs for Soprano, Clarinet and Harmonium. 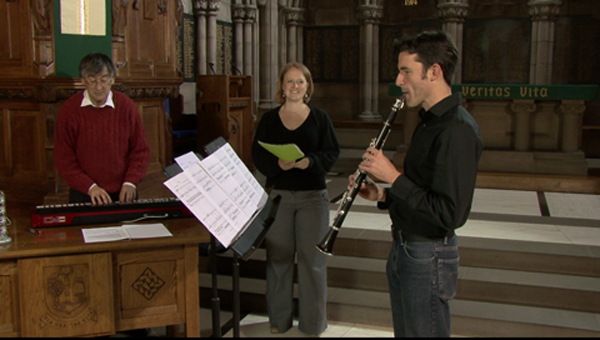 A more recent performance was prepared for a presentation at the International Computer Music Conference (Queen's University, Belfast, August 27, 2008) by Lisa Swayne (soprano), Alex South (clarinet) and Graham Hair (keyboard). Symphony for Voices and Orchestra or for Voices, Piano and Percussion. Graham Hair's deliciously eclectic Into the Shores of Light, inspired by the Australian composer's native coastal landscape: another piece which, in its dazzling orchestral palette, and its seductive swirling, Ravel-like rushes of colour, could have an immediate effect in mainstream orchestral programming. These are excerpts from the three cantatas which comprise Part 1 of the O Venezia project. Parts 2 and 3 will also be included in the CD release. See also "Revisiting �Simplicity and Richness�: Postmodernism after �The New Complexity� " (revised version now listed below under Transcendental Concert Studies Project). Project to provide an infrastructure for the for the processing, storage and manipulation of musical information and to present this information is a manner which is immediately useful to those involved in (mono-disciplinary and) inter-disciplinary music research. Interdisciplinary Perspectives on Measurement, Analysis and Interpretation. PDF file "The Interaction of Conflicting Forces in Keith Humble's Career, Musical Identity and Compositional Process, as Reflected in A Little Sonata in Two Parts"
PDF file"Keith Humble�s Modernism: from homogenous motivic-thematic organicism to heterogenous gestural constructivism"
PDF file "Dramatic Narrative and Musical Narrativity in Gillian Whitehead's Hotspur"
(forthcoming) Meeting Place: The Music of Don Banks. PDF file "The Fantasia for Solo Cello: A Close Reading, with Reference to the Sketches and the Compositional Process"
PDF file "Vocabulary, Syntax and Rhetoric in Thomas Wilson's Fourth String Quartet"
(2) (forthcoming) The Music of Matyas Seiber. A discussion of Seiber's 'non-concerto' pieces for soloist(s) and orchestra: Concertino, Elegy, Fantasia Concertante, Notturno, Pastorale and Burlesque and Tre Pezzi. PDF File Web version being progressively uploaded as from Nov 16 2007 (recent uploads: May 2009). Empirical Study of Bowing Techniques in Bartok's Third String Quartet and other works. Co-Investigators: Dr Amanda Bayley (Wolverhampton University), Dr Nick Bailey (Glasgow University: Electronics) and myself. Co-Investigators: Dr Nick Bailey and Mr Doug McGilvray (Glasgow University: Electronics) and myself. Studies of one of Australia's principal modernist composers, Larry Sitsky. An oral history approach to case studies in recent Australian piano, chamber and vocal ensemble/choral music, from 1975.